The Turnmills building was originally on the corner of Turnmill Street and Clerkenwell Road in the London Borough of Islington. The Victorian building opened in 1886 and was originally used as a warehouse and stables by the Great Northern Railway Company. The building later became a warehouse for Booth’s Dry Gin distillery before changing hands in 1985 and becoming a bar. The Clerkenwell area was well known for its gin distilleries during the Victorian era. Gordon's Gin distillery was originally sited in Goswell Road/Moreland Street, EC1, not far from Turnmills. Although English Heritage argued that the building possessed historic and an aesthetic value, the building was finally deemed not to be of considerable significance to be saved from the wrecking ball. The building finally closed on 24 March 2008. In 1985 John Newman purchased the lease on the building and opened a bar/restaurant on the site. In 1990, the venue evolved into a nightclub. The first successful club night held at Turnmills was Xanadu, run and co-hosted by London club promoters Robert Pereno and Laurence Malice. The venue was the first to obtain a 24-hour dance licence in the UK spearheading the move to all-night clubbing in the 1990s and became the home of several club nights including Trade, the first after-hours club in Britain. The Gallery (In-house event) playing progressive house, trance and techno. Trade (1990 - 2002 weekly - actually opened 4am Sunday Mornings) - Hosted and run by Laurence Malice. Smartie Partie (2003- March 2008) Monthly Resident. City Loud (3rd Saturday of each month). House music. Roach (2002 - 2003). Tom Stephan hosted a monthly deep & tech session. Warriors (1996–1997) Hard House Techno Club run by Buffalo. Melt (1997 - 1999) Techno, Nu-Nrg Club. 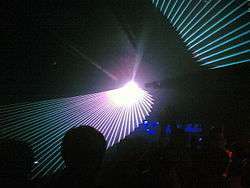 The Well (1998): Progressive trance music. Judge Jules at 'The Gallery'. Turnmills - Friday 22 September 2006. Turnmills Laser Light Show - 6 May 2006. On 24 January 2008, John Newman announced the building would close on 23 March 2008 as a clubbing venue, due to the expiry of his lease on the building. The building was later demolished and a new office building (despite objections) was built in its place. Starcom MediaVest Group are now located in the new building. ↑ name="dontstayin"> "OFFICIAL STATEMENT - Turnmills Farewell". Don't Stay In. 2008-01-24. Retrieved 2008-01-24. ↑ "Turnmills to become an office block". Evening Standard. 2007-12-28. ↑ "World famous Turnmills venue in Clerkenwell to be demolished". Islington Gazette. 2011-09-06. Retrieved 2013-11-13.